During Halloween many humans wear costumes, and some also try to include their pet in on the fun. 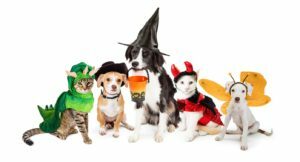 While there are many cute costumes available, pet owners should be aware of their pet’s disposition when trying to dress them. One thing that should not be scary during Halloween is getting your pet dressed up. While the costumes look totally adorable, we need to be mindful of how your pet feels about wearing clothing. There are a few training methods to teach your dog to get dressed, but my favorite is making everything into a circle so they can choose to put their head through it. Start with a circle ring shaped object and hold it in the air near your pet and place your other hand (full of treats) on the opposite side. Lure your pet through the hoop and rewards them for coming close or even stick their nose through. Eventually your pet will stick their entire head through, and this is really the primary goal. Once you can get the ring over their head without hesitation move on to something simple like a hat with a chin strap and hold the item open in a circle. Your pet will make the connection and stick their head through to get a treat on the other side. Repeat this process, and graduate how long the items stays on your pet- start with 1 second, then 2 seconds, then 5 seconds, etc. They will become soon comfortable with having that object on them. Remember to always use positive reinforcement! This idea translates into t-shirts, jackets, sweaters, and even Halloween costumes. Use the “head hole” of the clothing as a circle to invite your pet to get dressed. The dog is choosing to get dressed and this overall makes it less stressful on them. Plan your pet’s costume early and give them ample time to get acclimated to it before taking them out to show it off. Check out this article for other training suggestions. Have fun with your pet this Halloween! Keep in mind there are a lot of new sounds, smells, spooky items, and funny looking people- so be patient and understanding with your pet. Halloween can be overwhelming for our animals, so make sure your pet is in a safe and comforting controlled environment. Halloween is meant to scare humans, not our furry friends. Please safely store any candy items- be cautious of what your dog/cat could ingest! Check out this ViaGen blog about animal safety and protection.